As Jesus carries his cross to Golgotha, the Roman soldiers grab a man from the crowd to help. 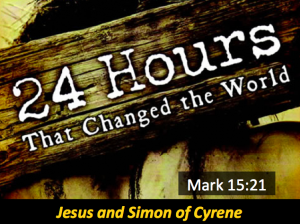 Simon of Cyrene met Jesus and his life, and the life of his family, was never the same. How does God work all things out for good? We get a glimpse as we see Simon carrying a cross with Jesus. Last week, we saw that Jesus was condemned to death by Pontius Pilate. Now Jesus begins the journey to Golgotha for his execution by crucifixion. Along the way, we meet a pilgrim who had come to Jerusalem for the Passover. His name is Simon, and he will be forced to help Jesus carry his cross. But this is not a chance meeting. God is at work amidst the evil surrounding everything that is happening. If we move on too quickly from Simon of Cyrene, we will miss the miracle. To prepare, read Mark 15:21… And then come Sunday to see how God can work all things out for good in spite of the circumstances.